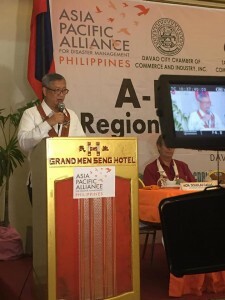 On January 24, Asia Pacific Alliance for Disaster Management Philippines launched the fifth regional platform A-PAD Davao at the Grand Menseng Hotel, Davao City. The City is known for beautiful nature, safe streets and easy access for tourists, but it is one of the disaster prone areas. Supported by Ministry of Foreign Affairs of Japan (MoFA), A-PAD has implemented a disaster management capacity building project in the Philippines, and one of the project’s goals is to establish multi-sector collaborative platforms in the most disaster prone regions. Through cooperation and coordination among government, the private sector, and non-governmental organizations, the regional platforms aim to deliver a more effective disaster preparedness, prevention and mitigation, emergency response, relief services to the community. A-PAD Bicol, Central Visayas, Eastern Visayas and SOCCSKSRGEN have been launched in 2018. 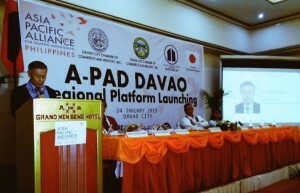 The launching ceremony was attended by Japan’s Counsellor & Director Yoshiaki Miwa from the Consular Office of Japan in Davao, Regional Director Manuel Luis Ochotorena at the Office of Civil Defense (OCD) XI and many representatives of A-PAD Philippines partner organizations including local government officer, chamber of commerce, disaster relief NGOs in Davao regions. 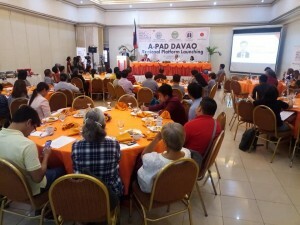 A-PAD Philippines and the participants agreed to cooperate one another to achieve the main purpose of A-PAD Davao. The ceremony was carried on the People’s Television Network (PTV).